Chimney Tops, Hike to Amazing Views in Only Two Miles! Two Peaks in Only Two Miles! While Chimney Tops is a very crowded trail, you just have to make a point to hike it. The mountain views are incredible! Yes, it is steep and will leave you huffing and puffing, but it only takes 2 miles to get there. That is, if you start from the parking lot off Newfound Gap. When we made this hike, we parked at Clingmans Dome Rd. We started our hike on Road Prong Trail for 2.4 miles, then hooked up with the Chimney Tops Trail for the remainding 1.1 miles. This is definitely the road less traveled. What was neat about taking Road Prong from Clingmans Dome Rd. is that was the first time we saw a black bear in the Smokies. Here's the story... It was the first hiking trip Mom and I took to the Great Smoky Mountains National Park. This was also the first trail we hiked. Looking back, I probably should have picked a shorter, less strenuous hike. But Mom's tough, she never gave up. Well, on the way back from Chimney Tops, I went on ahead and was waiting for her at the end of the trail. I could see her from the car. Looking down from my spot at the car to her on the trail, I see a bear poke it's head onto the path. At this point, she's so exhausted she's ready to lie down and take a nap. But when she sees that bear, she's in survival mode. She looks for the closest weapon she can find. On the ground nearby she finds a stick. She didn't need to use it since that bear was more scared of her than she was of him. He ducked out and ran off in the woods somewhere. Want to learn more about black bears? Check out my link for tips and more info on them. While this 1.1 mile hike is short, it's steep. You gain 1,350' in elevation. Once you get there, there are twin peaks that are 4,750' high! Approximate Elevation: Starts at just under 3500' at Newfound Gap Rd. Trail ascends to 4700' at Chimney Tops. How to get to the trail: If you want the short, but more crowded route, you'll find the trailhead off Newfound Gap Rd. 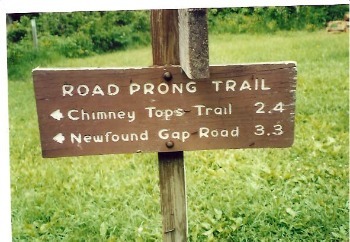 Hike 0.9 mile on Road Prong Trail, then take Chimney Tops Trail for 1.1 miles. If you want the longer, quieter route, you'll find the trailhead on the first parking area on the right as you're driving down Clingmans Dome Rd. Hike 2.4 miles on Road Prong Trail, then take Chimney Tops Trail.